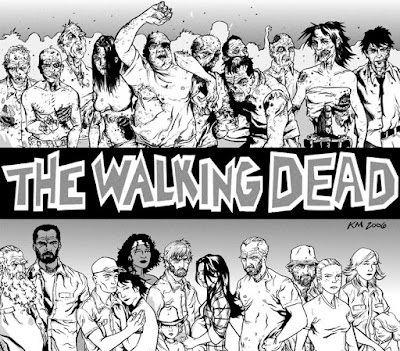 I have been devouring (hehe) Robert Kirkmans The Walking Dead comic for months now, and he has absolutely kept me always rabidly wanting more. If you haven’t had a chance to pick it up, it would easily top my list of recommendations for a new read. The Walking Dead Compendium Vol. 1 is a great way to get into this story, and compiles the first 48 issues together in a single book. The story basically follows the main protagonist Frank Grimes, a small town cop who awakens in the hospital from a short coma after being shot on duty, and a small band of survivors he meets up with as they try to find a way to survive in the aftermath of a zombie outbreak. Though that synopsis may sound clichéd, it is Robert Kirkmans relentless and sometime brutal storytelling that really drives the plot along. Drives it along like a schoolbus missing one wheel screaming down the interstate at 100 mph and being driven by a clown who left sanity sitting under a skidmark by the side of the road 5 exits ago. So it was with great delight that I heard the news some time back that the cable channel AMC was going to pickup the book and make it a series. In fact, the release date has been set to be Sunday, October 31st at 10EST/9CST. This first episode will be 90 minutes long, and there are to be 6 total episodes.